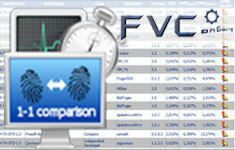 The advanced fingerprint algorithm was tested on one of the most difficult FVC tests – FV-HARD-1.0. It showed the best result among the other participants and proved the leadership of Sonda technology. Sonda took the first place on a number of indicators: FMR (10000), FMR (1000), Zero (FMR). This algorithm had a very high verification speed – about 9 milliseconds. The palmprint identification algorithm which was submitted for the first time passed PV-FULL-1.0. Palmprint verification consists in comparing two palmprints to determine whether they are impressions of the same palm or not. It contains full images of palms acquired in operational conditions using high-quality optical scanners. Sonda was the first on two of the six indicators: FMR (10000) and Zerro (FMR). The searching time was 111 milliseconds which is 5-20 times better than the most of other participants had. In summary Sonda had the best result in this test. Vladimir Gudkov, the developer, commented the test results: “We have done serious work on improving our algorithms. In six months made just a remarkable progress. Today our results are better on the most important indicators of FV-HARD and PV-FULL. These indicators are especially important for major software applications. There the fast, accurate and reliable identification is in a great demand. Such as biometric systems of police and military use, civil access control systems especially for nuclear power plants, airports or railway stations”.